This story was created by teachers who participated in the Smithsonian Gardens & National Postal Museum professional development workshop "Telling Garden Stories in the Digital Age," July 2014. The teachers were challeneged to explore green spaces near the National Postal Museum, create a persuasive garden story, and design a semi-postal stamp to encapsulate their cause. The stunning classical monument, planned to commemorate the discovery of the “New World” by Columbus in 1492, was the finishing touch to the elegance and monumental form of Union Station. Designed by Daniel Burnham in the last decade of the 19th century, the monument sits on a plaza currently maintained by the National Park Service. Over the course of the 20th century, the plaza has become the main transportation hub in Washington, DC, welcoming long distance travelers, Washington Metro subway system riders, and commuter rail workers to Washington, DC. It serves as a welcoming beacon to tourists from around the world to the US Capital city. Importantly, Columbus Plaza also provides a comfortable local home base for locals, who have developed a true allegiance to the park. Although many have limited means, they carry a strong civic pride in the plaza; the Plaza is a true local hometown park. It provides shade and a spirit of unity for disenfranchised community members. The lack of maintenance of all the beautifully designed water fountains next to the deplorable sand desert highlight a lack of commitment to all, both resident and traveler. The dilapidation of the statue and roses is directly in opposition to the location of the park with its proximity between the Union Station and the US Capitol -- a true challenge to the democratic ideals those places represent. As the plaque on Columbus’ statue reads: To the memory of Christopher Columbus whose high faith and indomitable courage gave to mankind a new world - it wrenches the heart and calls for further attention and action plus increased collaboration between the Park Service and local community to rehabilitate the park as a welcoming symbol to the nation’s capitol and empowering the local transient community. 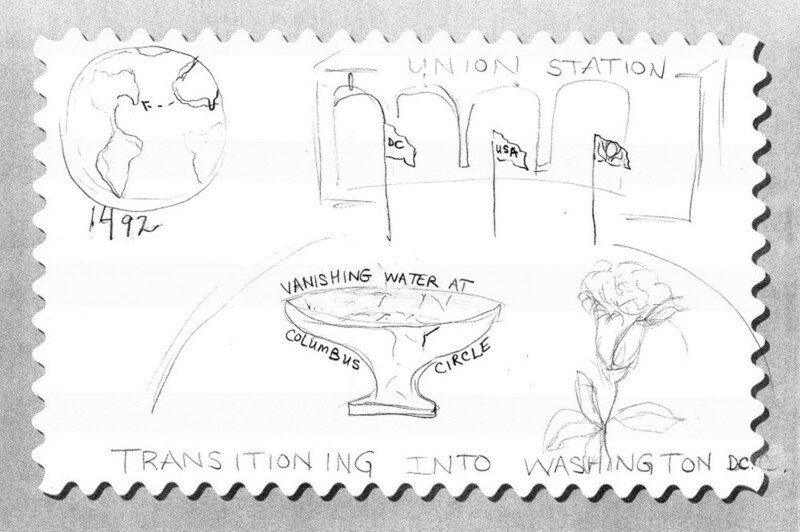 The teachers created this design for a semi-postal stamp to bring attention to the role of Columbus Plaza as a gateway to Washington, D.C., and its conservation issues.